Whether you want rhum agricole blanc blended with coffee or a beer and a shot, there's a bar for that—a really great one. Chicago has come a long way from being a post-shift, whiskey-and-beer town (not that there’s anything wrong with that). These days, the city’s bar scene thrives with creative bartenders and mixologists experimenting with ingredients, techniques, and philosophies. Whether seeking out austere, polished classics in the Loop, or heading to Logan Square—where new cocktail dens open regularly—for playful tiki drinks, there’s something for everyone. Just want that beer and a shot? No problem, that's still an option. 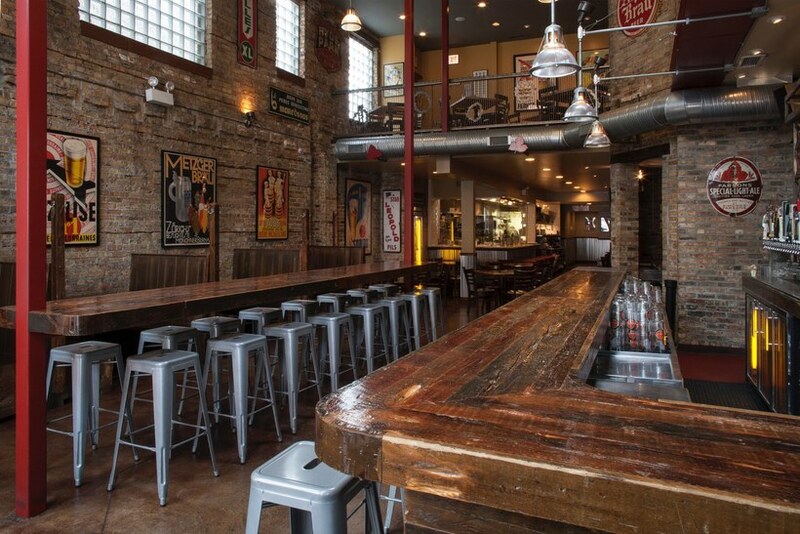 Our list of Chicago's best bars has it all. This sprawling brewpub, an offshoot of Revolution's brewery, proper, is always bustling with locals and tourists. Diners get a full view of the working brewery in the back, while up front, the large bar is as much a place to order pints as a community hub. Known for its creative craft brews, Revolution has almost everything on tap, including their Fist City Pale Ale, Eugene Porter, and Bottom Up Belgian-style Ale, plus a rotating cast of seasonal options. Casual enough for a random Tuesday night but serious where it counts, with some of the city's best cocktails and decadent gastropub food to go with. Cocktails are smart takes on classics, with a special focus on housemade tinctures driven by the seasons. They're also known for the "Good Book," a reserve list of spirits like super-rare vintage amari and Scotch whisky. Chef Matthias Merges is also the owner, so the food is definitely on point. A community hub with summertime DJ sets and outdoor cookouts, birthday parties and board game nights, Maria's is a window onto its neighborhood—and nothing like glossier downtown cocktail spots in the best possible way. It's a bit of a trek from the Loop, but the payoff is an only-in-Chicago vibe with fantastic beer, crazy good Korean-Polish food, and plenty of locals swapping stories with new friends. Like an old-school Chicago tavern—but with way better cocktails—Sportsman's Club is one of the city's most comfortable, hang-here-all-day spots. 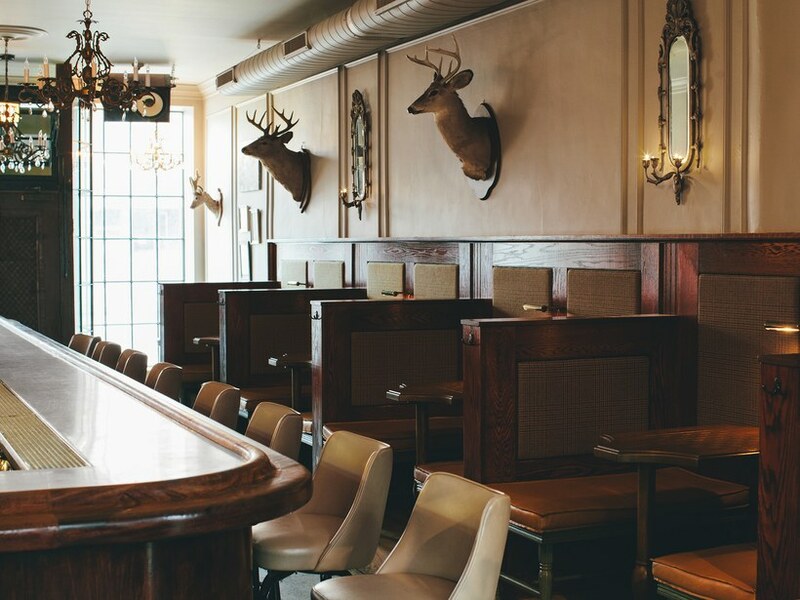 There's taxidermy on the walls, warm wood-and-tweed banquettes, soft lighting, and vintage touches. They put together a tight list of four cocktails every night, including an ever-morphing house drink based on amaro. This tiny, 13th-floor lounge is all about the views, from the top of the Robey Hotel, smack dab in the center of the Wicker Park neighborhood. It's a hotel bar with a little edge. The cleverly named Oaxacan on Broken Glass is a spice-forward concoction of Banhez mezcal, Hellfire bitters, and Ancho Reyes Verde chile liqueur; the 5 O'Clock Tea has Knob Creek bourbon, Earl Grey tea, and peach shrub. Probably Chicago's best tiki bar, Lost Lake pours on the fun without sacrificing on the quality of its superbly made drinks. 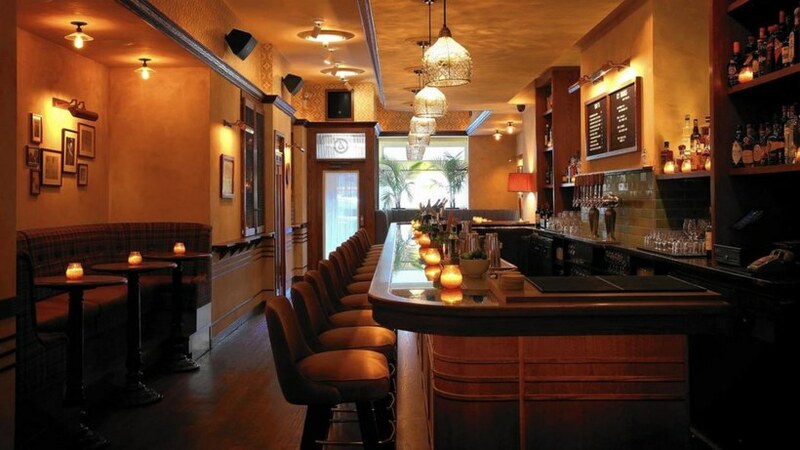 From cocktail guru Paul McGee (Milk Room, Cherry Circle Room), they have more than 200 varieties of rum in the house, plus enough tropical fruit juices to make your teeth ache—passionfruit, pineapple, tamarind. These are seriously good drinks, like the "Lonely Island Lost in the Middle of a Foggy Sea," with blackstrap rum, aged Trinidadian rum, and rhum agricole blanc, blended with coffee, pineapple, lime, and demerara sugar. This was one of Chicago's craft cocktail pioneers, and the ever-changing menu is consistently excellent, stacked with drinks inspired by the classics, like the Moody Rita, a margarita riff with Baltic Porter beer, and the Toleen, a wintry hot drink made with dark rum, red bean, almond milk, coconut, and Ramazzotti. Lively, stylish, and trendy, they've got a strong cocktail game plus nightly performances from talented acts. It was the first of Chicago's speakeasy revivals, and even today, the entrance is hidden behind an ever-changing mural. Hip bartenders hold court, while the music oscillates between hip hop, classic rock, and hits from indie darlings. Expect polished and precise cocktails, like the Byass and Me, a stirred sipper of Gonzalez y Byass vermouth, Amaro Cia Ciaro, and orange bitters, or the Ted's Talk, a blend of apple brandy, herbsaint, Cappeletti amaro, and tart cherry. If you can't decide, these bartenders are happy to surprise you with something on or off menu—as long as you follow the house rules: "no Grey Goose, no bombs of any kind, no Cosmopolitans." 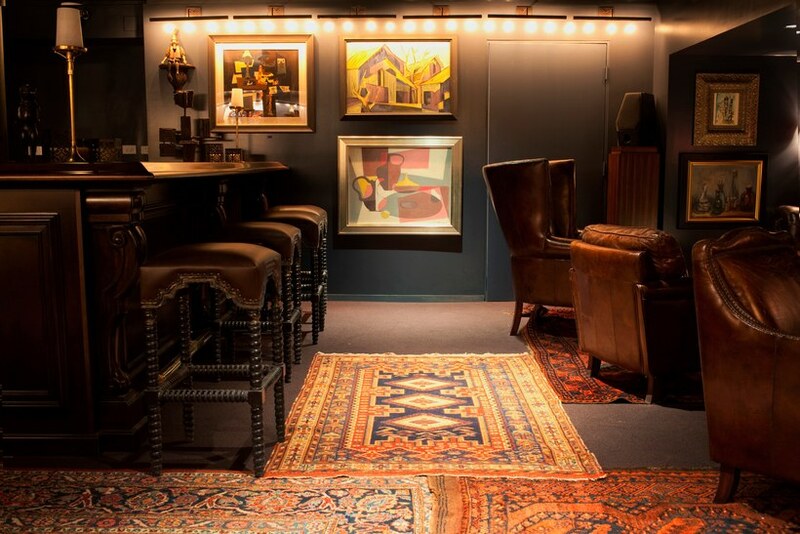 Inspired by 1940s-era lounges, complete with book-lined walls and luxe, tufted-leather sofas, Vol. 39 is one of the two worthwhile bars at the Kimpton Gray Hotel, along with Boleo on the roof. Head bartender Jess Lambert handles cocktails at both venues. At Boleo, the vibe is Peruvian, with group-friendly punches or seasonal draft chilcanos. At Vol. 39, old-fashioneds are a focus: The bar's signature version is made with 30-year-old Armagnac and barrel-aged demerara sugar. The Drifter is a rare find—a bar-within-a-bar speakeasy without ego that nevertheless focuses on craft and high-quality ingredients. It's inside the Green Door Tavern, a bar built in 1872 that actually was a speakeasy back in the '20s. This place takes cocktail geeky to another level. The menu, which appears on 40-plus custom cut tarot cards, changes every night, as head bartender Liz Pearce draws six to eight cocktails from the deck. Meticulously crafted sips include a chocolate negroni, a brandy milk punch with cayenne tincture, and a pisco-forward drink utilizing rhubarb shrub and spice-pickled berries. They've also got a limited selection of wine and beer. Fourteen taps of boundary pushing beers like the signature Daisy Cutter, a hop-forward brew balanced between bitter earthiness and fresh aromas. This crew specializes in microbrews and wild fermentations, forgoing clinical techniques for curious flavors and experimentation. Locals go crazy for their enormous burritos stuffed with rather creative fillings: Where else can you find a shrimp po'boy or pineapple pork fried rice burrito? String lights, hurricane candles, a disco ball, exposed wood beams—and some great live music. This is one of Chicago's oldest music venues, decked out with posters from past shows, brewery signs, and band flyers soliciting new members. Don't expect so much as a garnish here. The Hideout is a shot-and-beer joint—and they sell a lot of PBR and Jameson. You're here for up-and-coming acts, as well as some national headliners, poetry slams, podcast tapings, and even political panels—but at the end of it all, this is an old-school dive serving ice-cold beer. Candlelight, vinyl, and solid cocktails: This is Chicago's go-to spot for a romantic night out, set rather incongruously in a still-industrial corner of town just northwest of Goose Island. Cocktails are inventive, verging on geeky. The rotating menu features mostly brown spirits in drinks like the 50 Ways to Leave Your Lover, a bottled cocktail of Flor de Cana rum and Laphroig single malt with pumpkin chai and oleo-saccharum (citrusy sugar syrup). It's probably the best beer bar in otherwise unremarkable Wrigleyville and worth seeking out when you're catching the Cubs. It's a tight fit inside, so try to snag a seat on the patio overlooking the Park at Wrigley, the newly-designed plaza located in the shadow of historic Wrigley Field. Custom beers made specifically for the bar by local outfits like Burnt City, Dovetail, Right Bee Cider, and Maplewood. Easy-sipping draft cocktails are crafted by Lucky Dorr's sister bar, Billy Sunday. A new dining room, bar, and patio have greatly enlarged this Andersonville neighborhood local. It's an institution for a reason, with good food, better beers, and a chill staff that makes this huge space feel cozy. It's a city-wide destination for European-style craft beers, with an extensive, detailed menu that's constantly changing. Familiar Belgian offerings like Chimay and Delirium Tremens will put beer newbies at ease, but others—Bokor Vander Ghinste, Van Steenberg, Gouden Carolus—will intrigue aficionados. There are a half dozen wines on tap as well as a tight selection of ciders and meads, too. Milk Room is where spirits geeks and cocktail obsessives can find rare booze and (incredible, expensive) cocktails crafted by some of the city's best bartenders. It's worth flying to Chicago just to drink here. Beverage director Paul McGee brings his booze knowledge and geekiness to the fore, stocking his bar with rare and vintage spirits. (Think Fernet Branca bottled in the 1950s, Cherry Heering from the 1970s, a range of bourbons from the 1960s.) The menu is constantly changing to accommodate newly discovered bottles that McGee's network of buyers find at estate sales and auctions. Reserve well ahead. This is one of Chicago's greatest blues bars, with two performances on two stages every night of the year. There's a full bar, but most people are ordering stiff well drinks and foamy pints. There's not much to look at, just long four-top tables and stools, beer signs, and colored lights, but music lovers of all kinds, young and old, local and international flock here, especially on weekends. The secret's starting to get out: This still under-ther-radar wine bar is the perfect place for a low-key date or a chill night out with friends who dig esoteric bottles. Owner George Saldez is a hospitality industry veteran, and he's pulled together a list of 80-something wines, with a focus on his native Australia. Executive chef Jeff Williams, formerly of Sable in River North, does shareable plates inspired by Spanish and Italian bar bites. Appointed like a study or old-timey smoking room, the tiny Office is one of the hardest reservations in the city—but you already knew that. Scour the site Tock for reservations at least a couple months in advance for seats at this convivial, feels-lived-in rec room downstairs from the ultra-modern Aviary. The $20 drinks from the ever-changing list are riffs on classics—but made with ultra-rare spirits. They've got a deep stock of Old Rip Van Winkle, and a cabinet of Chartreuse, with vintage bottles dating back decades. Anyone into playful cocktails that also taste great will appreciate this Lincoln Square spot, which has the downtown vibe without being in over-saturated, perpetually packed River North. Riffs on classics get creative ice—yes, ice—and head bartender Benjamin Schiller's flair. Representative is the Silly Rabbit, a gin-and-mint drink served in a Collins glass stacked with four flavored cubes—"lemony yellow, orangity orange, raspberry red, grapity purple"—that call to mind breakfast cereal as you sip. Goose Island may have lost some street cred when it was bought up by Anheuser-Busch InBev, but you wouldn't know it by the crowds of fan boys who pack the recently renovated tap room, clamoring for Chicago-famous brews like Four Star Pils and Sophie. With 28 beers on tap at the main bar, there's plenty to choose from, and pretty solid pub fare: a pepper-crusted Stilton burger, dry-aged hanger steaks, IPA-battered fish and chips. 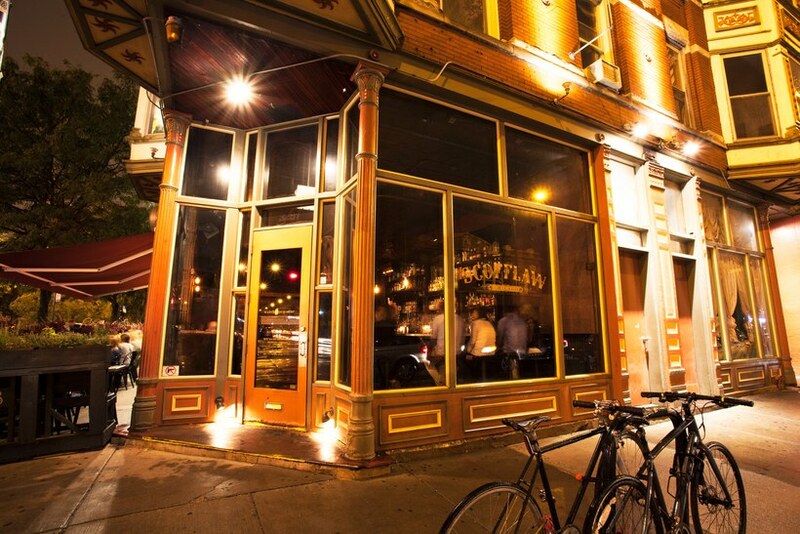 This is one of Chicago's best wine bars. The well-sourced list features natural, sustainable, and biodynamic bottles from small family producers from around the globe, with names like Broc Cellars, Emmanuel Rouget, Le Sot de l'Ange that will excite wine geeks. It's got wine-friendly bistro fare, like an extensive cheese, olive, and boquerones selection. Webster's is the gold standard for approachable and enjoyable wine bars, whether you want a hands-on education or just a simple glass served with warmth. Nothing if not eclectic. The bar, which is broken up into a number of different spaces, is built from reclaimed materials including a bowling alley lane, high school chemistry lab tables, and old pinball machines. Cocktails are clever and boozy, like a punch of Scofflaw's Old Tom Gin and Aperol or a white Manhattan made with George Dickel's unaged whiskey. They've also got a rotation of well-known craft brews from the likes of Founders, Lagunitas, Lost Abbey, and Stone. A reliable neighborhood joint in the Pilsen area that's seeing more and more visitors. This Bucktown tavern looks like it's been here forever, with walls lined with vintage issues of National Geographic and constantly changing chalkboard menus. It's a laid-back coffeehouse by day, but they always have 25 beers on tap, plus many more bottles, from close by (Chicago's own Motor Row Brewery) and farther afield (California's Firestone Walker, Japan's Kiuchi Brewery). It's a no-frills window onto locals-only Chicago, where you can share pints with strangers or bring your whole crew. 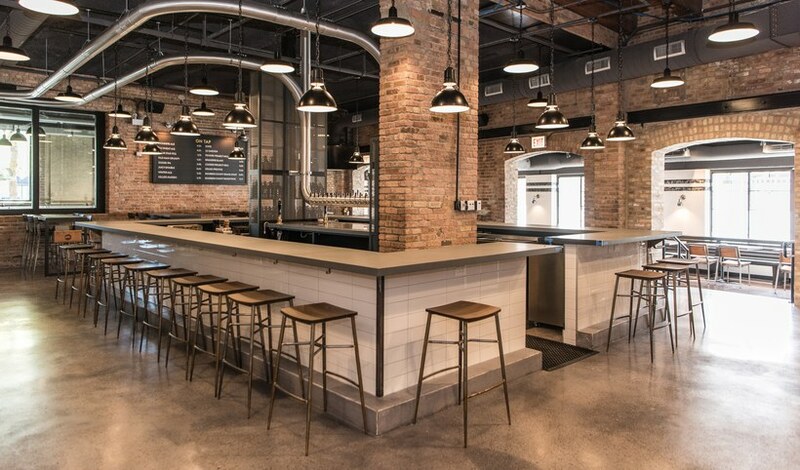 A bit out of the way, Whiner's the perfect excuse to visit a lesser-seen section of the South Side, with funky beers, terrific pizza, and a location in a fascinating startup incubator set in a former industrial complex. 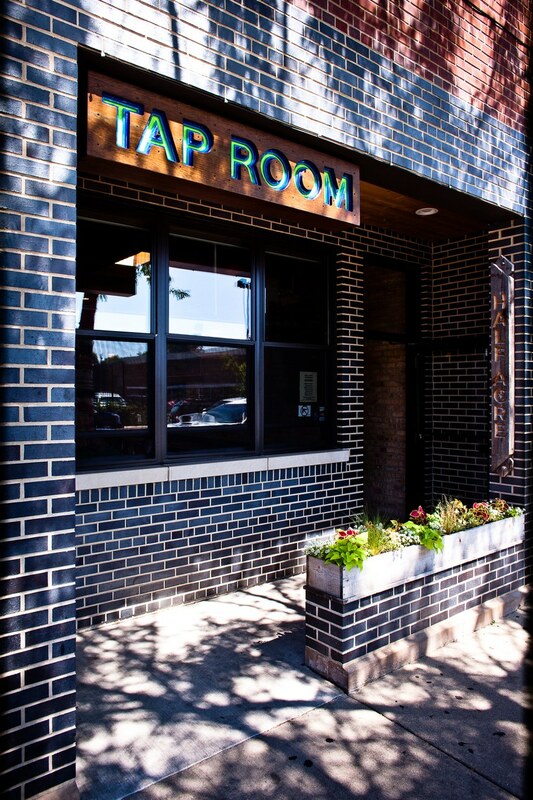 The tap room is part of a bigger complex, The Plant, which also has an aquaponics farm, a bakery, a coffee roaster, and many other start ups on site. Whiner specializes in wild and sour beers brewed in French and Belgian-styles, meaning most are softly fizzy with interesting, funky flavors. Set inside an Art Deco apartment building from 1927, this narrow bar channels old-school, Prohibition-era hotels, with plush furnishings and smart-looking vintage knick knacks. It could've come off corny, but here, it absolutely works. Cocktails lean heavy on rum, with drinks like the Stinger (Cognac, rum, and creme de menthe) and the Hotel Nacional (apricot liqueur, pineapple rum, and lime juice). Located in the Gold Coast, it's close to many of the city's most popular neighborhoods.